Soft tissue sarcomas are relatively uncommon neoplasms. The annual incidence rate is about one or two per 100000 population (Cutler and Young 1975; Rantakokko and Ekfors 1979; Agnarsson et al. 1991). 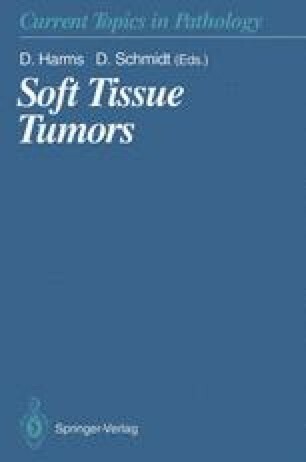 The American Cancer Society placed the estimated number of new soft tissue cancers in the United States in 1991 at 5800 (0.5%) out of a total of 1100000 new cancers in all sites, and 3300 deaths (0.6%) per year were caused by these tumors out of a total of 514000 cancer deaths (Boring et al. 1991). Other data from Brazil indicated that 3759 soft tissue cancers were diagnosed during the period 1976–1980, and accounted for 1.0% among a total of 369767 cases of cancers in all sites (Brumini 1982). The Annual of the Pathological Autopsy Cases in Japan included 493 deaths caused by malignant soft tissue tumors (0.4%) out of a total of 128002 cancer deaths in all sites during the period 1984–1988, compared with 19538 deaths of lung cancer and 18567 deaths of gastric cancer (Japanese Society of Pathology 1984–1988) (Table 1).